Time for spring cleaning – – dusting off my old toys and putting things in order. And just in time for snow-melt and daffodils, as folks gather for the first time on their favorite terraces to drop winter attitudes and smile into what looks like it might finally be a new year, we are launching our next round of Challenges in the Balkans. 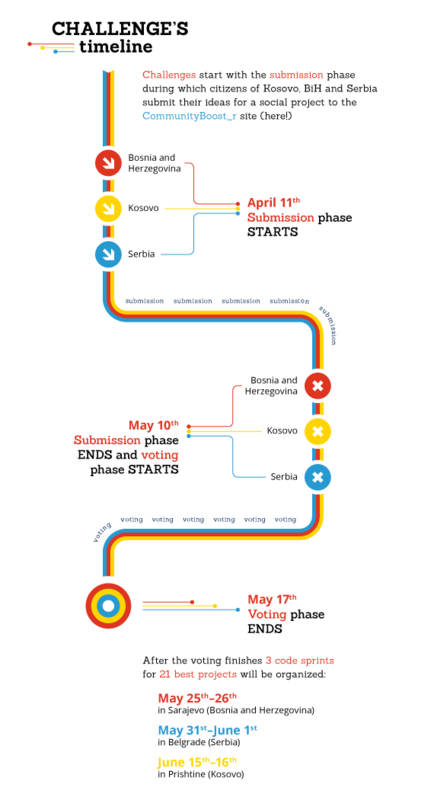 Also known as ReStart in its former Romanian, Czech and Slovakian iterations, this Grand Challenge model opens a space for citizens to pitch web and mobile projects that aim to engage their fellow countrymen in offline social change. After a selection process, we partner with a bunch of hacktivist geeks to build these new ideas and get to playing with new technology for the social good before launching them out into the world. What makes the ReStart/CommunityBoost_R Challenge model a bit different than other hacking4good processes out there is a clear community orientation. When designing ReStart 1 back in 2011, I wanted something between weekend hack models (great for demonstrating that tech can play a role but often lacking final products) and Grand Challenge models (think the X Prize – – lot’s of money, not many engaged in the process). The ReSulting methodology focuses heavily on community building around social leaders. First civil society, communications and technology professionals, legal and political expertise as close friends; and then a community of online supporters. All before any investment is made in the projects. Should the idea, and it’s leader prove motivational enough to deserve a community, we happily provide the rest and thus, a market-tested project is carried to fruition complete with constituency and advisors to spur adoption and keep building the social-tech solution. NOTE: yet anothersynchronous blog postings with two of my favorite people – read their take @ http://madamadepica.blogspot.roand http://codruvrabie.blogspot.ro. Each week we write on a theme. Feel free to propose a topic.